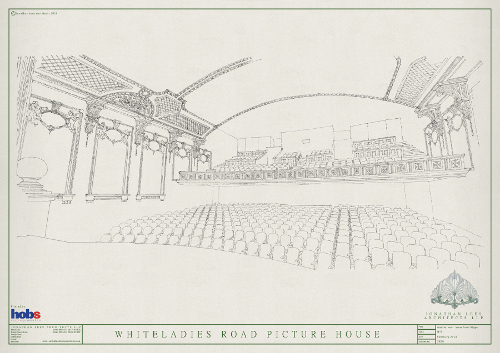 Even as the owner Medinbrand Ltd. awaits a decision on their applications made last month for planning and listed building consent (announced here on 9th January this year), a rival proposal has been announced today by the Whiteladies Picture House Ltd. A not-for-profit company which raised £10k through crowd-funding in less than a month, they have engaged Jonathan Lees Architects and are today unveiling plans to create a 580 seat cinema, a separate 60 seat cinema beneath the original balcony, and the reinstatement of the historic foyer and ballroom. David Fells, the founding director of WPH Ltd., intends to create “…an exciting, and financially viable, community-focussed venue”. The plans will be on show at the Be In Bristol bar, on Whiteladies Road, on Saturday 15th and Sunday 16th March, and more details will be available here from 8:00pm today. Meanwhile, the decision on Medinbrand’s applications is due by 18th April 2014. Architects Woodward AP Ltd. have proposed three separate cinemas (for 316, 118 and 94 seats), as well as 7 apartments (6 new, 1 existing) and a small private screening room for hire. Details of the applications before the City Council may be found here. It seems rather like busses; one waits decades for a rescue package for this much loved local cinema, then two come along at once! Owner Medinbrand calls on campaigners attempting to redevelop the former cinema to stop asking for donations from the public. See full story by Bristol24-7 here.